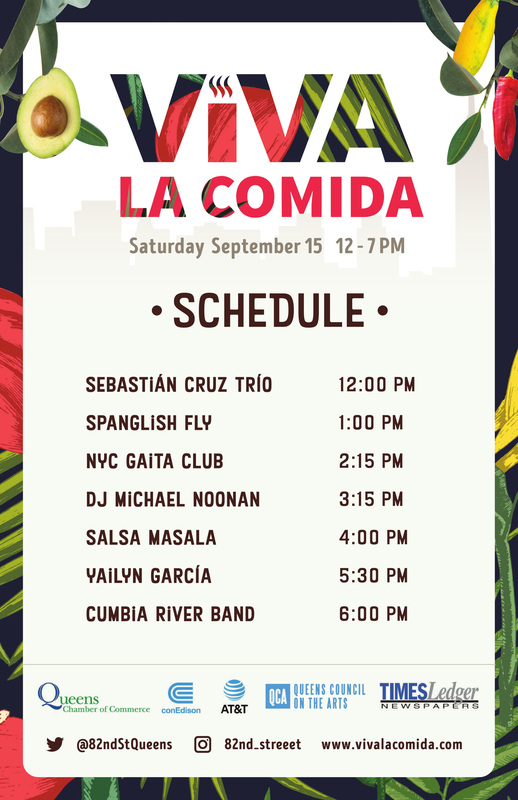 Come see what’s cooking at the 7th annual Viva la Comida food and music festival in New York’s greatest melting pot, Jackson Heights, Queens! The multicultural extravaganza returns with an eclectic array of street food vendors, local restaurants, and live musicians bringing New York, Latin American, India, and Afro-Caribbean flavor to the streets. Viva la Comida is a production of the 82nd Street Partnership and a celebration of diversity and culture that you don’t want to miss. This year’s festival will be held on Saturday, September 15, 2018 from 12:00 pm to 7:00 pm along 82nd Street, between Roosevelt and Baxter Avenues. Viva will be bringing attendees traditional foods representing 14 countries from South and North America, the Caribbean, and Asia. The festival will be anchored by several award winners and beloved street food vendors, such as Jackson Heights’ favorite Arepa Lady, Solber Pupusas; Tortas Neza, and Vendi Award Vegan Cup winner Mysttik Masala. Returning festival favorites include: The Malaysian Project, serving their delicious Ramly Burger, Chef Troy with a variety of Jamaican flavored vegan dishes, Mama Food, serving her delicious Xinjiang-style grilled squid and lamb skewers, Mom’s Momo offering a variety of freshly made momos, Jhal providing Bangladesh fuckka and jhal muri and 2018 Vendy Award nominee El Sabroso de Aracataca with delicious Colombian arepas (Congratulations Luis!). Roosevelt Avenue mainstays Ricas Botanas will serve freshly made churros and other Mexican treats and Oscar’s Chuzos & Corn will be present as well. Evelyn’s Kitchen will be serving Peruvian ceviche and Tostones Rechenos will be dishing up stuffed fried plantain cups. This year two new restaurants will join the festivities. At Igloo Rolls you can savor Venezuelan fried plantain sandwiches and a variety of ice cream rolls. With their Arabic/Mediterranean cuisine, visit Zaytoun for crispy falafels that you can have stuffed in an arepa, savory shawarmas, and the flavorsome Tunisian salad. Long-term community staples will also be present. Delicias Colombianas will have morcillas (blood sausages) and the traditional Bandeja Paisa. Sabor Ecuatoriano will offer traditional Yaguarlocro, a dish cooked with lamb tripe from the Andean region of Ambato in Ecuador. Casa Rivera, an old-style butcher, market and restaurant, serves traditional South America foods and treats—this market has an exceptional variety of hard-to-find Latin American products. Mixing sounds from jazz and Indian to Salsa and from Cumbia to Boogaloo, this year’s performers will bring to the stage a mixture of lively sounds unique to NYC. Cumbia River Band Martin Vejarano’s (Chia’s Dance Party, La Cumbiamba eNeYé) music projects draw from a festive repertoire of Colombian Cumbia standards. These classics will take you back to the golden years of the genre. Salsa Masala: A Jackson Heights Block Party. Inspired by the music of Latin America, the Indian subcontinent, and black music of the US, Salsa Masala speaks to the role places like Queens play in an increasingly diverse America: creating connections across communities that demonstrate that “we all feel similar emotions and rhythms, even if they’re in different languages.” The project was created by Neil Padukone and this will be its world premiere. Sebastian Cruz Trio Colombian rhythms, and creative improvisation propelled by an electric power trio featuring world-class improvisers Stomu Takeishi on bass, and Satoshi Takeishi on drums, alongside Sebastian Cruz’ guitar. This trio is both Colombian and universal, and is as much about sensitive songwriting as it is about creative musical explorations. This year, the John Lennon Education Tour Bus, a state-of-the-art mobile audio and HD video recording and production facility joins Viva la Comida. Young people will be able to participate in free digital media production workshops, and the production of giant peace signs. Assisted by three on-board engineers, visitors can learn how to write, record, and produce original songs, music videos, documentaries, and live multi-camera video productions – all in one day! Queens World Film Festival will host a Pop-Up-Film-School designed to engage the public in activities that will expand their knowledge of the photographic and filmmaking capabilities of their cell phones. They will also host a Red Carpet where Viva la Comida attendees can learn how to make the perfect selfie, how to post incredible photos and boost engagement across social media.